Henderson, William B.. "Indigenous Self-Government in Canada". The Canadian Encyclopedia, 13 July 2018, Historica Canada. https://www.thecanadianencyclopedia.ca/en/article/aboriginal-self-government. Accessed 20 April 2019. Indigenous self-government is the formal structure through which Indigenous communities may control the administration of their people, land, resources and related programs and policies, through agreements with federal and provincial governments. Treaty negotiations between Canada, British Columbia and Tla'amin Nation concluded on 21 October 2011. 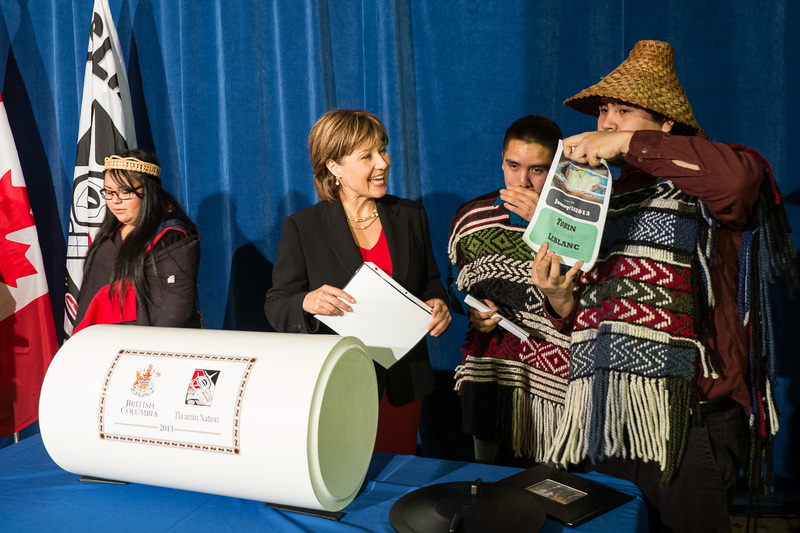 Looking forward to a future under self-government, youth members of the Tla'amin Nation placed personal mementos into a time capsule, celebrating the introduction of provincial legislation to ratify the Tla'amin treaty. They were joined by Premier Christy Clark, Aboriginal Relations and Reconciliation Minister Ida Chong and Tla'amin Nation Chief Clint Williams. Indigenous self-government is the formal structure through which Indigenous communities may control the administration of their people, land, resources and related programs and policies, through agreements with ​federal and provincial governments. The forms of self-government, where enacted, are diverse and self-government remains an evolving and contentious issue in Canadian law, policy and public life. The Indian Act, 1876 dismantled traditional systems of governance and imposed external controls — in the form of local Indian agents and the federal bureaucracy of the Department of Indian Affairs (now ​Indigenous and Northern Affairs Canada) — on individuals and communities. Not until the late 1960s and early 1970s did increasingly effective political organizations and intensifying activism, along with several high-profile disputes over development in Canada’s North, set Canada on a path toward acknowledging and enabling forms of Indigenous self-government. This trend gained momentum in the late 20th and the early 21st centuries, and Indigenous peoples saw their rights to self-government affirmed in the ​Constitution Act, 1982, and in international documents. The right to self-government, however, is far from being enshrined in law. At the end of the 20th century, Canadian courts made several rulings on matters regarding Indigenous rights. Matters closely related to the concept of self-government, such as jurisdiction over lands and peoples and regulation of traditional activities, have emerged through these cases. Canadian law has taken a gradual approach to broadening law-making powers and jurisdiction through the exercise of Indigenous rights. In the Sparrow case (1990), for example, the Supreme Court of Canada sidestepped the issue of whether the Musqueam Nation in ​British Columbia had jurisdiction to regulate the fishing rights of its members. In the Pamajewon case (1996), the Court was prepared to consider the possibility that a right of self-government was recognized by Section 35, but did not actually rule that the section had that effect. In the Delgamuukw case (1997), the Court declined to deal with the issue. The Pamajewon case involved the Shawanaga and Eagle Lake First Nations and their right to authorize and regulate high-stakes bingo games on their respective reserves. The Court held that such gaming was not a defining or integral feature of the societies in question prior to contact with Europeans and was not protected as an Indigenous right. In general, for the Court to acknowledge jurisdiction to regulate, a group would have to establish that the activity itself is a protected right and that it was regulated by their ancestors prior to contact. This suggests an incremental judicial approach to self-government rather than general recognition of the right to self-determination. During the 1980s and 1990s, special committees recommended that broad, even drastic, measures be taken in Canada to recognize and implement self-government, and the issue was raised during the process of patriating the ​Canadian Constitution. A Special Committee of the House of Commons on Indian Self-Government was appointed in 1982, and in 1983 it produced the Penner Report, which recommended that ​First Nations be recognized as a distinct order of government and that processes leading to self-government be established. Section 35 of the Constitution Act, 1982, had recognized "existing Aboriginal and ​treaty rights,” but this term was left undefined. The desirability of a constitutional amendment explicitly recognizing an inherent right to self-government was debated in the constitutional conferences of the 1980s and was revived during the negotiation of the Charlottetown Accord in the early 1990s. The Accord proposed a constitutional amendment to explicitly recognize Indigenous peoples' "inherent right of self-government within Canada." A national referendum in 1992, however, rejected this and the other Charlottetown initiatives. The Royal Commission on Aboriginal Peoples, which was formed in 1991, reported to the federal government in 1996 and proposed solutions for a new and better relationship between Indigenous peoples and the Canadian government. Among these solutions, the Commission urged that the "existing Aboriginal and treaty rights” recognized and affirmed by Section 35 of the Canadian Constitution include an inherent right to self-government. It has been through the land claims (or comprehensive claim settlement) process, rather than constitutional amendment, that individual communities have achieved differing levels of self-government. Numerous claims have been negotiated with discrete provisions for self-government and levels of co-management with other governments. All Canadian governments, including Indigenous ones, are subject to the Constitution and the Charter of Rights and Freedoms. The James Bay and Northern Quebec Agreement (JBNQA) of 1975 was negotiated and settled largely in response to proposed hydroelectric power development vigorously opposed by ​Inuit and ​Cree who had never signed a treaty with Canada. The Naskapis of Northeastern ​Québec joined the negotiations during the later stages and signed a companion agreement (the Northeastern Quebec Agreement) in 1978. The JBNQA — as well as the Penner Report — resulted in the Cree-Naskapi (of Quebec) Act, 1984, the first piece of Indigenous self-government legislation in Canada, which replaced the Indian Act and established Indigenous communities in the region as corporate entities. In 1984, the ​Inuvialuit of the Mackenzie Delta in the ​Northwest Territories signed the Western Arctic Claim, or the Inuvialuit Final Agreement, which allowed for the participation of the Inuvialuit in a limited form of local self-government through the creation of the Western Arctic Regional Municipality. Building on the James Bay and Northern Quebec Agreement (1975) and the Inuvialuit Final Agreement (1984), more recent treaties enable ​bands to set up municipal and corporate structures. A historic example is the ​Nunavut claim settlement, concluded in 1993, which resulted in the creation of the new territory of Nunavut in April 1999. Apart from its legal provisions, this created a self-government agreement since the overwhelming majority of the more than 32,000 residents of Nunavut are Inuit. In British Columbia, the comprehensive Nisga'a Final Agreement, finalized in 2000, also made provisions for self-government within settlement lands, but was criticized on that basis and challenged in court. The Nisga'a treaty gave the First Nation the right to self-government within the 2,019 km2 in the Nass Valley to which the Nisga’a hold title. This includes the authority to manage their lands, assets, and resources and the ability to make laws in regard to Nisga’a citizenship, language and culture. Other First Nations in British Columbia continue to negotiate their claims, with agreements finalized with the Tsawwassen First Nation and the Maa-nulth First Nations in 2009 and 2011, respectively. Some ​Métis communities have achieved, or are in the process of negotiating, self-governance agreements. The 1990 Métis Settlements Act of ​Alberta provided a land base for eight Métis communities in northern Alberta and allowed for the establishment of local traditional-style government. The settlements are subject to provincial and federal law, and with the Alberta government, jointly manage subsurface resources on settlement territory. In 1993, the Sahtu Dene and Métis of the Northwest Territories signed a comprehensive land claim agreement with the federal government. The claim contains a Self-government Framework Agreement, which has been, and continues to be, used in negotiations with the territorial government to establish self-government in the Sahtu Dene and Métis communities covered by the claim. In the United States, Native American (or "Indian") tribes are recognized as "domestic, dependent, sovereign nations" with inherent rights to govern within their reservations, to make laws, to establish courts, and to enjoy immunity from external lawsuits. This doctrine of domestic sovereignty has never been applied in Canada with respect to Indigenous peoples, although many argue that under international law, the same doctrine should apply. The adoption of the United Nations Declaration on the Rights of Indigenous Peoples (UNDRIP) by the United Nations Permanent Forum on Indigenous Issues in 2007 was at first opposed by Canada because of issues concerning land disputes and the declaration’s clauses about the duty to consent that could impact resource development. UNDRIP represented two decades of work on the part of Indigenous peoples from around the world, and while Canada had initially supported this work, its rejection caused a ripple of unrest. In 2010, Canada joined the other Anglo-settler countries of Australia, New Zealand, and the United States in endorsing the UNDRIP as an “aspirational” document. After a change in federal government, Canada signed UNDRIP in May 2016. It has yet to be seen how Canada will implement this agreement. The judicial approach to Indigenous self-government is methodical and incremental. Political negotiations have established some powers of self-government for individual communities of First Nations and Inuit, but have yet to fully address the claims of Métis and those of other Indigenous peoples who do not reside in Indigenous communities. All political negotiations are under increasing scrutiny by those who either oppose any degree of self-government for Indigenous peoples or who argue that constitutional amendments are required to give effect to the self-government agreements. Report of the Royal Commission on Aboriginal Peoples (1996). O. Dickason, Canada's First Nations (1992, 2002). Olive Patricia Dickason with David T. McNab, Canada’s First Nations: A History of Founding Peoples from Earliest Times, 4th edition (Don Mills, ON: Oxford University Press, 2009).